Did The Moon Break Off Or Was A UFO watching the Apollo landing? Um... is it possible that a bit of the Moon literally broke off or was a UFO watching the Apollo landing? NASA won't say anything. NASA has a lot of explaining to do. One of the image they simply can't explain is where where it seems as if "a piece of the Moon" appears to have "broken off" in one of the Apollo 11 images. The images caught the attention of UFOlogists around the globe when YouTube user Streetcap1 uploaded the images to his UFO research channel. US-based Scott C Waring, editor of UFO Sightings Daily said: "This is a great photo of the moon in high quality. "However there is one odd thing about it. A piece of it is breaking away." He added: "It is possible that aliens have evolved so high, that living longer is the gold of their times. So to accomplish this, they create ships and buildings that blend into the environment. This could be a ship leaving the surface, and if astronomers see it moving through space, they will believe it to be an asteroid." YouTube user Streetcap1 also said in the video it looked "like a piece of the moon is breaking away". So what are we looking at in the mysterious Apollo 11 image? Is this really some sort of UFO as Waring and other suggest? Or is it possible that there is a perfectly normal explanation? So far, it seems that the boys and girls at NASA have had a difficult time explaining the image. Luckily there are two images of the same area of the moon taken by the Apollo 11 astronauts. The two images were taken just moments apart, and mysteriously only one of the images features the mysterious "object." What's your guess? Are we looking at an optical illusion? A piece of the moon breaking off? A UFO? Or another NASA spacecraft? 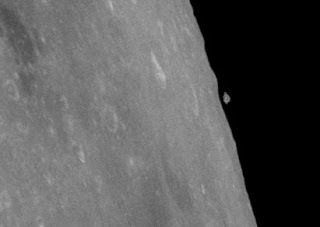 Dwayne Brown from NASA's communications office has not commented about the mysterious Apollo 11 image. Is NASA avoiding talking about the image because they are unable to explain it? And how likely is it that we are looking at some sort of UFO as many UFO websites suggest? Whatever the mysterious object is, it certainly is out-of-place, has no explanation and is one of the many NASA images that is most definitely "anomalous." Let us know what you think about the object and NASA's silence.